Foundation laid and blessed for church with help from Wichitas District Volunteers in Mission. 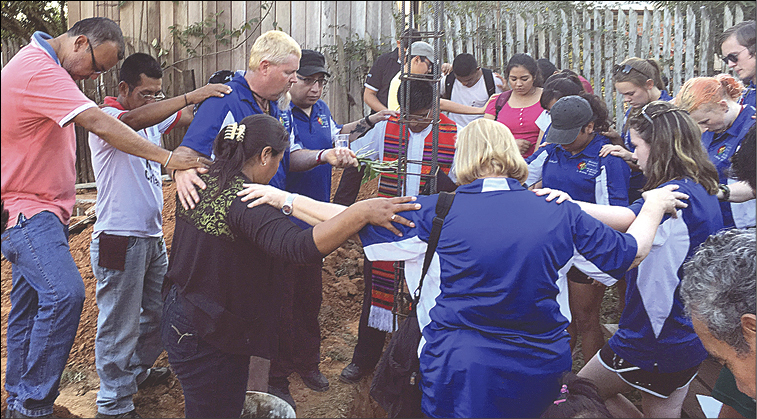 The Wichitas District celebrates its sixth year of sending Volunteers in Mission teams to Cobija, Bolivia, to serve with members of the Bolivian Methodist Church. During the June mission this year, we got to participate in blessing the cornerstone for a new church building. 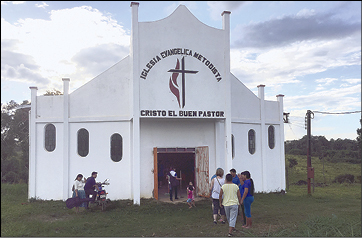 In 2012 the former Lawton District made a 5-year commitment to build a church for the congregation of Cristo el Buen Pastor (Christ the Good Shepherd). The people were meeting in the local Methodist school. That church was completed last year. This year we began moving out to serve in the Amazonico District of Northern Bolivia, to Villa Vista, just outside Cobija. Work has begun on Nueva Criatura (New Creation), one of the oldest Methodist churches in that district. The congregation needs to move from the original wooden structure, open on three sides, to a brick building with bathrooms and a small kitchen. Pastor Mario, the 72-year-old founder of Nueva Criatura, shared with us the history of the church in the area. The blessing service was an extremely moving moment. With church members, we spent several days digging trenches for the foundation walls. But the construction work we do on the churches in Cobija is only a small part of our mission. We have built strong relationships with the Methodists there. We visit all the small churches in the district and worship with them. We go to the Methodist school and answer students’ questions. Our schedule includes visiting a children’s church in an impoverished area. The ministry is run by members of Cristo El Buen Pastor. The children use a Sunday School curriculum specific to Bolivian culture and designed through collaborative work by another group of Oklahoma United Methodists and members of the Bolivian Methodist Church. Our 11-member Wichitas District team came from Lawton-Centenary, Altus, Apache, Hollis, and Walters churches. We had four youth volunteers, four on the team had served previously in Cobija, and several were VIM first-timers. Randy Oakes, a new VIM Team Leader, did a great job. We return again in June 2018. To learn more about our work, view our team blog, lawtontocobija2014.wordpress.com.